I vividly remember picking up my then 10-year-old daughter, Bethany, after her initial week at camp. While I envisioned her jumping into my arms, she shot me a friendly smile and a wave before returning to her new friends. In the moment I was disheartened, but more than a dozen years have proven that experience to be an important first step in her journey towards independence. And what about the homesickness that is so prevalent among beginning campers? 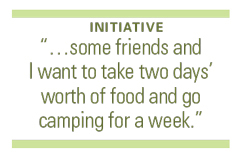 “It absolutely happens,” says Muller, “but we know the best way to keep it at bay is by keeping kids engaged.” Homesick campers tend to wane between minutes of downtime or bedtime when kids realize they are out of their normal routine. “Two days in is the key,” she says, adding that by day three, they are settled into a routine. The parent’s job is simply to give them a happy send-off and then not give in to worry. While reluctant kids and homesick campers are only two obstacles, parents also have to address their own hesitations. “I try not to let my own fears stand between my kids and independence,” says Richmond mom of three Hollie Gilman. “I knew there were things I wanted them to do that might make me nervous, yet I was also certain they needed to develop independence.” Gilman found the right fit in North Carolina’s Outreach America Camp, whose motto is “Born Wild, Set Free.” As the motto implies, the rugged setting encourages outdoor adventure. What’s more, the camp is screen-free and, except for emergencies, communication-free. “As a mom, I want to protect them and to control things, but I know I won’t always be able to,” says Gilman, who only learned after the fact, following last year’s session, that hunting and eating a snake was one unexpected experience her sons encountered. 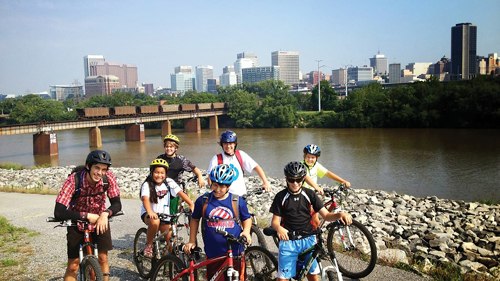 Camp provides the perfect atmosphere for kids to try new skills, explore new opportunities, and really let down their guard in a brand new background – like this group exploring along the James River. Kevin Tobin, co-owner of Passages Adventure Camp, agrees. He says children know the difference between genuine self-confidence and false self-esteem. “Kids don’t get enough credit for knowing what’s up,” he says. 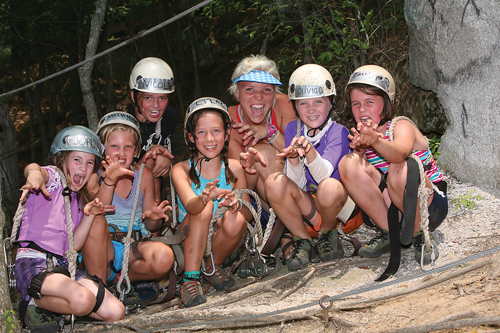 “The confidence that they’ve gained from rappelling down the wall or kayaking through that first break is authentic confidence, the kind that comes not from applying compliments, but applying yourself to something that looks a little scary and coming through to the other side.” Tobin adds that campers are always eager to show off their new skills on parent night. What’s more, their parents are amazed at what kids have accomplished. 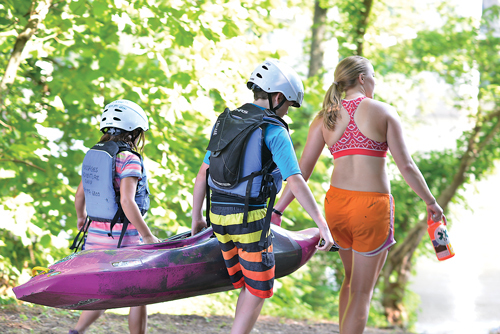 Parents whose kids may be hesitant to try extreme or unfamiliar sports should remember that confidence comes in all shapes and sizes, as do camp activities. Once kids begin to learn independence, a newfound identity often follows. In his book, Homesick and Happy, author Michael Thompson, PhD, highlights the experience of one 14-year-old boy, David McDonald, who discovers his talent not for riskier ventures such as swimming or horseback riding, but to his surprise, glass blowing, at camp. “It changed the way I felt about myself forever,” said McDonald. 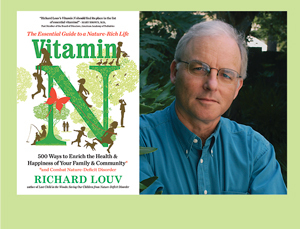 “The direct relationship between nature experience and healthy child development cannot be underestimated,” says bestselling author Richard Louv. The camp setting provides a kind of traction that enables kids to reinvent themselves or simply be themselves. 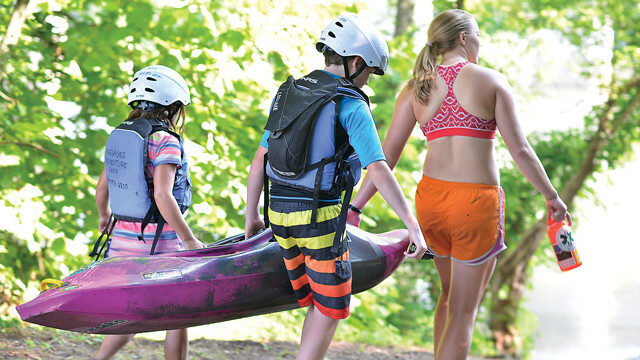 “We place kids with different staff every day,” says Tobin, “so if you’re the quiet kid on Monday, you don’t have to be the quiet kid on Tuesday.” Tobin adds that school doesn’t often offer those kinds of organic breaks that allow kids to find themselves, and camp is just the right venue. “I firmly believe that everyone at different times in life deserves a new setting to take stock of who they are and who they want to be.” Camp provides the perfect atmosphere for kids to try new skills, explore new opportunities, and really let down their guard in a brand new background. 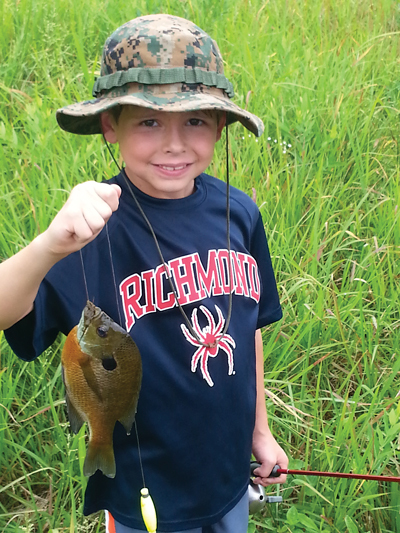 While these types of camps compete with other programs not directly related to nature, such as tech or academic, outdoor themed camps provide families with more of what is so rarely offered elsewhere: direct experiences in nature. “The direct relationship between nature experience and healthy child development cannot be underestimated,” says Louv, who first coined the phrase “nature deficit disorder” in 2005. “NDD is not a medical diagnosis, but a metaphor to describe what many of us believe are the human costs of alienation from nature, as suggested by recent research.” Among them: diminished use of the senses; higher rates of physical and emotional illnesses; child and adult obesity; vitamin D deficiency; and other maladies. My son is a typical teenage boy. He loves Doritos and spends more time than I care to admit playing video games. The plans he and his friends made spoke volumes: Despite the invasion of screens in every form, it is just in a kid to crave outdoor adventures. And I love that he wants to catch his own food, to boot. 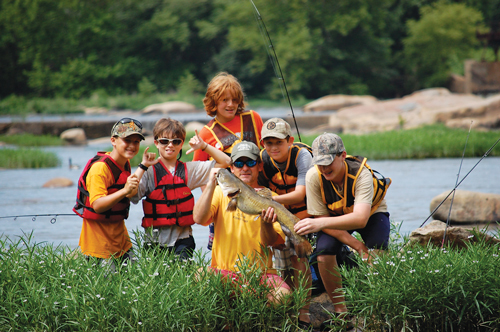 Camp adventures and opportunities along the James River are plenty for kids of all ages, including hiking, ziplining, mountain biking, fishing, and a variety of water endeavors. From where I sit, summer camp is a safe, solid first step in the journey. 1. Give your child the gift of letting him or her go. 2. Prepare your child for homesickness. 3. Do not try to manage homesickness from a distance. 4. Do not make the “We’ll get you home if you’re unhappy” deal. 5. Help your child practice the skills they need before they leave. 6. Use letters, postcards, and other slower forms of communication. 7. Take a vacation from parenting. Have some fun and don’t feel guilty about it! A freelance writer and mother of ten, Margie Sims has contributed to a variety of regional magazines during her twenty years of writing about parenting. She moved to the area in 2012 and lives in Moseley with her family.